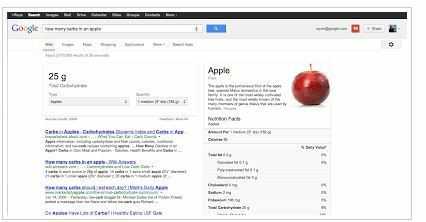 Nutrition information for 1000 different types of food will from today be available in google search. Google today announced the new service where you by just typing “how much carbs are in corn” you will directly get the nutrition information in your search result. Figuring out how to make smart choices about some of our favorite foods can often be a cumbersome and daunting process. So we’re hoping we can make those choices a little bit easier: starting today you will be able to quickly and easily find extensive nutrition information for over 1,000 fruits, vegetables, meats and meals in search. From the basics of potatoes and carrots to more complex dishes like burritos and chow mein, you can simply ask, “How much protein is in a banana?” or “How many calories are in an avocado?” and get your answer right away. This is a service that I am sure many people will start to use. It is so easy to just get it in your google search or by using the voice feature on your phone you can get the nutrition information without even needing to type a single letter. I have done some tries on google to test this out myself but could not find any results yet. According to googles blog it could take up to 10 days before it is widely available. Let me know if you try out this feature and what you think of it. This entry was posted in Information and tagged google nutrition search, google search, nutrition information, nutritional search on May 30, 2013 by Johan Bengtsson. Low carb diets that focus on eating a high amount of fat are often held up as a miracle diet for a healthier life, while plummeting in weight. Normal name for these diets are the keto diet, LCHF and Paleo. But new research shows that it is pure horror diet. The greatest danger is that it is inflammatory and affects the brain in a negative way. Moreover, people are depressed, tired, sleepy and sluggish thinking. People are lucky that they quickly become narrow, but it has a high price. Fatigue and depression have previously been more or less known ailments.Reports on cancer has now begun to enter. Everyone who buys books praising low carb diet such as the keto diet and LCHF may not know the dangers and of course it’s very tragic. The big fat consumption affects our hormones in a negative way, while the fat stick in the colon. It can cause breast cancer and colon cancer. Research also shows that for a long time there is no difference in weight loss if you choose a high fat diet or a low-carbohydrate diet, ie a diet that is low in protein and low in fat. Doctor and LCHF proponent Annika Dahlqvist disagree about the health dangers. – They are wrong, wrong, wrong. It is absolutely terrible to scare people in this way. Fat is not at all dangerous and eating according to a low carb diet has many health benefits, and I am just tired when I hear this, she says. This entry was posted in Facts and tagged cancer, fat doctor, keto diet, keto scare, LCHF, lchf scare, low carb diets, low carb scare on May 20, 2013 by Johan Bengtsson. One serving, or 85 grams of meat from cattle, pigs or sheep a day leads to the risk of dying from cancer or heart disease increases by 13 percent, according to the study from Harvard who is the most comprehensive undertaken. The worst is the intake of processed meat. Two slices of bacon or one hot dog a day leads to increased risk by 20 percent. There is no need to drag in any emergency, but the study confirms that there is reason to rethink their intake of red meat. To avoid eating processed meats completely is pretty drastic. However, there is reason to eat limited amounts. More and more restaurants and popular low carb diets such as the keto diet and lchf focus on meat. And we eat more and more of the good. The meat consumption increased from 58.9 kilograms per person per year at the turn of last year’s 64.2 kilograms, according to figures from the Agriculture Department. Too much red meat and not enough vegetables. It was not that the diet was conceived. One can reduce the red meat and by eating poultry, fish, vegetables and dairy products. It is possible to eat balanced without the red meat. NFA is now considering introducing advice on how much meat we should have in us. We are waiting for results from our studies we’ve just done, to see if meat eating increases. It is likely that the intake has increased, and then we might have reason to introduce council. Why the red meat is dangerous, however, is still unclear. Among others mentioned the saturated fat, iron content and occurrences of nitrites in many meat products. 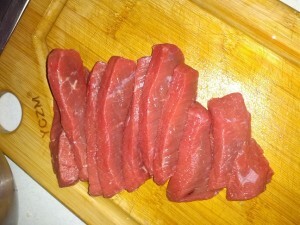 This entry was posted in Facts and tagged beef, cancer risk, dangeroud food, heart disease, red meat, the keto diet on May 20, 2013 by Johan Bengtsson. You can test various fast diets and lose weight, that is no problem. Most likely you will lose a few pounds. The problem is that the human body is not made for eating only pineapple, grapefruit or bananas for a long time. Eating according to a specific diet for a very long time can have serious health risks. Soon your longing for eating something that is bad for you will be too big and soon all the pounds that you just lost are back again. Diets differ very much from what people usually eat. Initially, one can reach a good effect. But it is almost never in the long run. In order to achieve a lasting less weight you have to look over their entire lifestyle. But in a few weeks would be willing to live extremely ascetic and only take one or two foods are naturally lose weight. If you want to see quick results, they in virtually any diet works. You can eat peanuts or Danish pastries and drinking red wine and coffee only do you eat less than you spend and you can surely lose weight, but that is no long-term solution. The optimal diet for everyone, especially older people, could be the Mediterranean diet which high in fish, vegetables, nuts, and vegetable oils. In short fats that makes your body and mind feel good. Researchers have collected the data from a study for more than 40 years, following 70-year-old people, half men and half women and notes that 70-year-olds who ate a variant of the Mediterranean diet consisting of plenty of fruits and vegetables , the right kinds of fats and avoided really sweet foods on average lived two to three years longer. Not surprisingly, the people who ate a lot of meat, sugar and a little fish had a shorter life. Low carb diets are the diets in recent years moved up the most emotions and has divided many people into two groups, the ones that are for and against a high intake of saturated fats to reduce their weight. The dangers majorly comes down to it might not be good to be on a strict diet which can eventually lead to illness because you are not getting enough of what your body needs to feel good. If the scale is firmly pointing up, it’s time to eat less and start to move and to maintain muscle, but also to feel better mentally. Keto diet used properly, which is drawing down on coffee bread and replacing the candy to nuts, coupled with increased physical activity can be great. But those who use and interpret it in the wrong way, this is the most dangerous diet we have had in a long time. At worst, it can lead to strokes and heart attacks, is what many people on the negative group says. This entry was posted in Facts and tagged diet problems, health risks, keto risks, low carb diet risks, risk with keto, risks with lchf, risks with lowcarb, risks with paleo on May 19, 2013 by Johan Bengtsson. It has long been known that vitamin D protects against osteoporosis, and new, large studies have shown that it reduces the risk of heart disease. Now, several studies show that good levels of vitamin D also can reduce the risk to the trivial diseases such as colds and flu, and serious health threats like cancer, diabetes, depression, rheumatoid arthritis and MS. The fact is that many people have low levels of vitamin D. The vitamin require intense sunlight to form in the skin – which is why so many people deficit of the vitamin during the winter months. Although it is possible to ingest vitamin D even through diet – but nowhere near the amounts of an hour or half an hour of sun exposure in the summer can provide. There are a variety of diseases that we suffer more from during the winter months. The relationship is crystal clear: it is due to the lack of sunlight, which in turn provides us with a deficit of vitamin D supplementation. – In the USA there was a study which looked at U.S. women’s vitamin D levels and breast cancer incidence. The women came partly from the northern United States, and from the south. In the south, they had higher vitamin D levels, and half as much breast cancer. Levels of vitamin D and the incidence of breast cancer were in very good agreement. What is interesting is that at higher vitamin D levels, you are less prone to infections. When vitamin D intake increases the formation of a protein that makes it difficult for bacteria and viruses. There are several ongoing studies on vitamin D effects on major diseases, including cancer and hypertension. The fact that vitamin D protects against osteoporosis, we know. Then there have been a number of smaller studies in other areas that led to the research questions and hypotheses. These studies are not enough for us to draw reliable conclusions to. Now it requires substantial studies. There is currently very intense research on vitamin D in the world. There has been a forgotten vitamin, but now it is time again. The next few years we will get more and more accurate. It however could be recommended that you should think about eating more fat fish. Then you get vitamin D, omega 3, selenium – all at the same time. Vitamin D is a fat soluble vitamin, which means that it accumulated in the body instead of being lost in the urine. There is a risk of overdosing. Some groups are at extra risk of developing a distinct lack of vitamin D. These are people who rarely go out, such as the elderly, and those who use highly opaque clothing, and therefore not exposed to sunlight. A problem here is of course that the sun’s rays not only helps to form vitamin D – they can also cause skin cancer. To protect ourselves, we use increasingly using sunscreen – that not only protect against cancer, but also makes it impossible for the skin to produce vitamin D supplements. To manage the production of Vitamin D, you should sunbathe without sunscreen for 15-30 minutes. Then you go in, or cover yourself with clothes. So far, the message has been that at all costs to avoid the sun to prevent skin cancer. But now we see that we must also look at the production of vitamin D supplementation. We have to balance between melanoma and other diseases. This entry was posted in Facts and tagged cancer, depression, diabetes, flu, health benefits, heart disease, omega 3, suppliments, vitamin D on May 19, 2013 by Johan Bengtsson. There are many hypothesis that omega 3 fat acids are important for the development of depression. 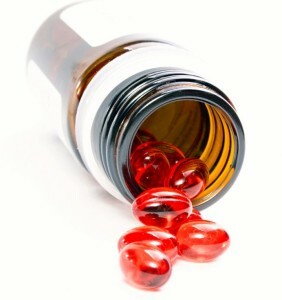 There are also studies showing that the levels of the two most important omega 3 fat acids EPA (eicosapentaenoic acid) and DHA (docosahexaenoic acid) decreases in red blood cells with depression. Now there are a number of randomized, double-blind studies that suggest that omega 3 could also have some effect in the treatment of depression, at least for some patients. The studies are consistently small, often with only 20 to 30 patients, and have varying patient populations and treatments which differ widely in terms of the balance of EPA and DHA. In six of the eight studies in the treatment of depression with omega-3 has been shown more effective than by using placebo. There have also been occasional positive studies in bipolar disorder and perinatal depression. But there are also a lot of studies that did not show any effect at all, but no studies have been showing that the placebo is better than omega 3, which could possibly indicate a small and elusive treatment effect. It is also proposed mechanisms for how omega 3 fat acids could be important for the development of depression. Omega 3 is a building block of all cell membranes and is important to the receptors and cell permeability of various molecules, and it also has anti-inflammatory properties. Once again an additional intake of Omega 3 has been shown to have health benifits. This entry was posted in Facts and tagged depression, DHA, EPA, fat fish, fishoil, omega 3, omega 3 fat acids, placebo on May 19, 2013 by Johan Bengtsson. A study in Sweden shows that children who are regularly eating more fish are 5-12% more intelligent than those who do not. Guys that are 15 years old that eat fish once a week was three years later six percent smarter than their peers who did not eat fish once per week. For the guys who had fish twice as often were around twelve percent smarter than their peers according to a survey of nearly 4,000 teenage boys. The boys had the age of 15 participated in a survey of eating habits. The results were then compared with the intelligence tests conducted at enrollment into the military in the age of 18. – No matter how we twist and turn in the results as they stand here ready linkages firm, says Professor Kjell Torén at the Sahlgrenska Academy. The results and intelligence improvements also seems true even taking into account socio-economic factors, housing standards, parental education, adolescent health, exercise habits and weight. That fish in the diet promotes the positive development of the nervous system in both children and adults is well known from several other studies. Even the early development of chilren in their mothers belly they can be affected if the mother eats higher amounts of fish. But this is the first study that investigated the effect on teenagers. The reason may theoretically as well be that intelligent people are eating more fish, not that the fish made them more intelligent. But the study is interesting and there is a reasonable biological explanation. Fish is rich in omega 3 fat, which is known to be lacking in modern Western diet. This study further proves that adding additional Omega 3 to your diet is benefitial and would give you additional health benefits. You could also get these benefits by eating additional fish, but that would require very high amounts of fish. This entry was posted in Facts and tagged fat fish, fish, fish diet, intelligence, intelligent, omega 3, omega 3 fat on May 19, 2013 by Johan Bengtsson. If you use google+ you are welcome to join us and other keto diet friends at our new community. This entry was posted in Facts and tagged community, google+, keto diet google+ on May 16, 2013 by Johan Bengtsson. Nuts and seeds are included in low carb diets such as the keto diet in moderate amounts. People who are accustomed to snacking all the time may easily get too many nuts, which for many has become the new healthy treats. Sure, nuts and seeds can be good keto food. The problem with nuts is that they contain a lot of carbohydrates along with fat. The carbohydrates stimulates insulin production and insulin production stimulates fat synthesis and inhibit fat loss. The combination is not good. Therefore, eat nuts with the lowest content of carbohydrates. Brazil nuts have a low carbohydrate value (3.1 per 100), Walnut (3.3 per 100), cashews (18.1 per 100). Seeds you can also eat too much of. Seeds are recommended for low carb-bread, but I do not think it is so good to eat it daily for all meals. A seed based meal with low carb-bread can be a great way to vary the food. It is almost impossible to calculate how many carbohydrates you ingest by eating seeds. That is because many of the whole seeds pass the gut without being taken up as a nutrient. Chewing the seeds thoroughly or grind them before use will probably mostly be addressed. Whole flax seeds have a laxative effect but no nutrients are absorbed in the intestine. Some seeds have high carbohydrate values, but flaxseed contains none at all (0g/100), sesame seeds (9 g per 100), sunflower seeds (14 per 100). Normal diets contain a lot of carbohydrates and little fat. That means we have to eat big portions to get enough energy and be satisfied. If instead we eat low carb diet such as LCHF or keto diet and plenty of fat we will after a few days reduce the portions because we grow faster feed. The vast majority of regulating portion sizes perfect fully automatic because we know the saturation faster. However, if you eat too little food, the body into starts thinking it is food shortage and conserve fat reserves. Muscle mass is broken down as it is an energy-demanding tissue to hold in times of crisis. Therefore, it is important that when we start with the low carb diets to not eat too little. If we eat too little we do not get all the health benefits with the keto diet. Today we know that after some time we will not have any problem with eating a little less, because then we also have good burning of body fat into energy, (if we avoid carbohydrates). 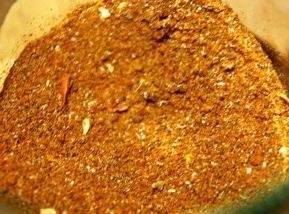 This entry was posted in Food and tagged diet, fat loss, keto diet, keto food, loose fat, nuts, seeds on May 16, 2013 by Johan Bengtsson.